Two years ago, when Jon Lester was diagnosed with cancer, did anyone think he'd even pitch again, much less pitch successfully? I know I didn't. 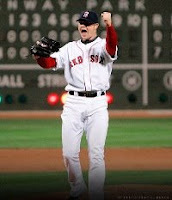 Lester came back from his illness to pitch Game 4 of the 2007 World Series, and last night at Fenway, he pitched a no-hitter against the Kansas City Royals. Ordinarily, when something like this happens to the Red Sox, I could care less. However, it's hard to be a rival when the story is this good. Anyone who's battled cancer or who has gone through any type of crisis in their life should feel inspired by Jon Lester's story. So, for today at least, I tip my cap and say "Congratulations, Jon Lester."